as the range, where the integral gives a maximum of r². If Eu and Ed stand for the energy of the circular waves, then ru and rd stand for corresponding ranges. Eu = v rd = v rd2/rd = Wd and analog Ed = v ru = v ru2/ru = Wu. Since the energies do not fit with the direct exchange, it remains with 8 exchanges. 8, because the down-osci in the proton and the up-osci in the neutron occur twice with a different phase shift (I was spared the indexing). The colour charges are therefore superfluous! The strong interaction has to respect the dilemma of the QT. With regard to the permutation phenomenon this allows the conclusion that its validity cannot be caused by the partner. But it is also not a coincidence, as can be shown later with the preschool experiment - see NEUTRINOS AS OSCIS AND MORE. The strong interaction occurs when a propagation line penetrates into the range of the range. Their distance on the scale from 0 to r = range determines the upper limit of the integral via the density function. Since only the propagation line is of interest when the wave is torn apart, the waves may be rotated into one plane to calculate the strong interaction - the forget-funktor. The pivot point is determined by the point symmetry. 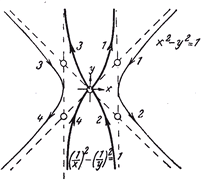 This results from the required symmetry of the oscillation as a wire model (rotation group). The points also give the common reference line on which the energy density function is to be plotted. 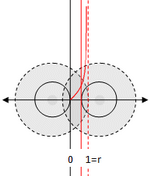 The zero lies at the intersection with the propagation line. Bonding paradox: The permutation phenomenon leads to an interesting result. A balanced energy balance is therefore only achieved with the helium nucleus, with which its mass defect can now be roughly calculated (see PDF, Anhang A.1). The strong interaction may or may not occur as a probability-theoretical effect. With the dilemma of QT, its reciprocal occurrence in two waves is only allowed in the sense of either-or. On the other hand, the waves are thus independent in terms of probability theory. The resulting strong interaction can then be calculated using the multiplication theorem. With the dilemma of QT, the strong interaction cannot be a multitasking one! There is also the strong interaction of a wave with itself. With the folded dipole wave, the strong interaction is = 0, because the upper and lower limits of the integral are = 0. With the density function, the probability can also be interpreted as follows: Their contra-probability is a measure of the recurrence of a strong interaction. The dipole wave is only busy with itself. With regard to the strong interaction of other waves, it is virtually invisible. (Es + ΔEs)2 + (Es - ΔEs)2 = Ed2 + Eu2, bzw. Eu2 + Ed2 = 1, where the underscore stands for the normalization to the unit circle. Wd ◦ Wu = (Ed2 - Ed4)1/2 und Wu ◦ Wd = (Eu2 - Eu4)1/2. The equations show that the strong interaction of one oscillation does not interfere with the strong interaction of the other, so that the above multiplicative operator is not commutative - which was to be shown. Excited proton: A comparison of the classical equation of motion with the integration via the energy density function shows that this leads to a much lower deflection of the centers of gravity, since the integrated values increase much more strongly. In the TO, the prediction matches the results of the experiment, and the sea quarks are superfluous! The fact that what was cheated into the standard model to make it fit is not necessary with the TO. But their effects remain as mathematical effects! Zero-point-energy: Their existence is based on the uncertainty principle. However, due to the energy equation of the oscillation, this only applies within the range of the strong interaction, and since its energy is always positive due to its probability-theoretical derivation, there can be no extinction, i.e. no zero point fluctuation, within its range of validity! Space is the space in which the general theory of relativity (GR for short) applies. The electromagnetic field theory (EMF for short) refers to this space. It itself presupposes the electromagnetic field as space. However, the relationship is doomed to failure, since time as the fourth dimension is differently integrated in them. However, the incompatibility of the spaces can be mitigated with Einstein's special theory of relativity (SR for short). It's needed anyway, in electrodynamics. In the SR, the relation of time to the other dimensions can be expressed quite simply. In this representation one speaks of the Minkowski room. With it the RT can be described at least locally, i.e. in each individual spacetime point. A separation of EMF and RT is on the one hand physically necessary, on the other hand it remains locally ineffective! The solution brings the strong interaction in the form of the associated probability space - see previous chapter. Each interaction has an effect on the space as a whole, so it must not be viewed in isolation! A must, because otherwise the problem of radiation feedback would remain unsolved. To this day, it can only be solved in quantum electrodynamics. The solution, however, requires quantum logic and leaves the GR outside. It is well known that their inclusion fails as long as the Maxwell equations and the ART remain untouched. Since in the TO both theories are regarded as secured, standardization is ruled out from the outset. A symmetry, as required by the Neother theorem, remains a symmetry, no matter how space-time is curved!